Topiaries are created by shaping plants into ornamental forms or shapes with pruning. The plant, typically an ivy or boxwood, is shaped around a frame and eventually grows into that shape, filling in. Caring for topiaries is essential because it will guarantee that the foliage is dense and the plant is healthy. Plant topiaries in containers so they can be moved inside or out, depending on the weather. Topiaries need constant care to achieve the desired appearance. Train vines to grow around the topiary frame. Tie the stems onto the form using twist ties if necessary. Tuck stray vines into the frame to maintain the desired shape. Prune the topiary regularly to form the perfect shape. If there are long pieces, cut them back to promote bushier growth. This will fill in the topiary by keeping the plant dense. Place the topiary plant in a bright and sunny location. Put it in a windowsill or outdoors in the summer. Rotate the plant once a week so that each side gets the same exposure to sunlight. This will ensure that each side of the plant grows evenly. Keep the topiary moist. Many types of topiary plants including ivy and boxwood will start to turn brown if they dry out. Touch the soil and if the surface is dry, sprinkle the plant with a garden hose or kitchen sprayer. Prevent the roots of the topiary plant from sitting in water. This will make the roots rot. Put gravel in the saucer to keep the roots from having direct contact with the water. Give topiary plants an all-purpose fertilizer every four to five waterings. For less maintenance, you can use a slow release food in the spring. Follow the instructions on the package. Do not over-fertilize because it will cause excessive growth and could even burn the roots. 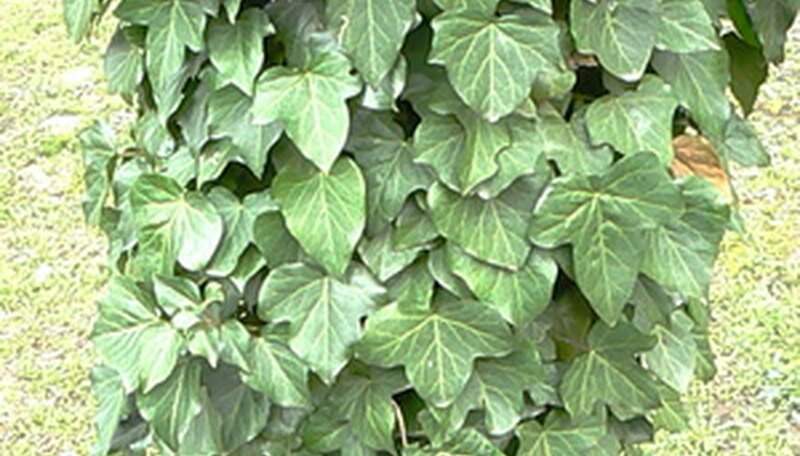 Look for spider mite, which effects ivy plants. They infest the underside of topiary plants leaves and leave yellow splotches on the topsides. The leaves will fall off. Spray the leaves all over with lukewarm water and follow with an application of insecticidal soap. See the instructions on the package. Re-pot topiary plants every year or every other year. Take the plant out of its container and loosen the roots. Put the plant in the new container, which should be 1 to 2 inches larger. Fill with soil and water well. Protect topiaries from wind and hot sun. Submerge a topiary plant in a barrel of water if if completely dries out. Use sharp pruning shears to avoid damaging the plant.